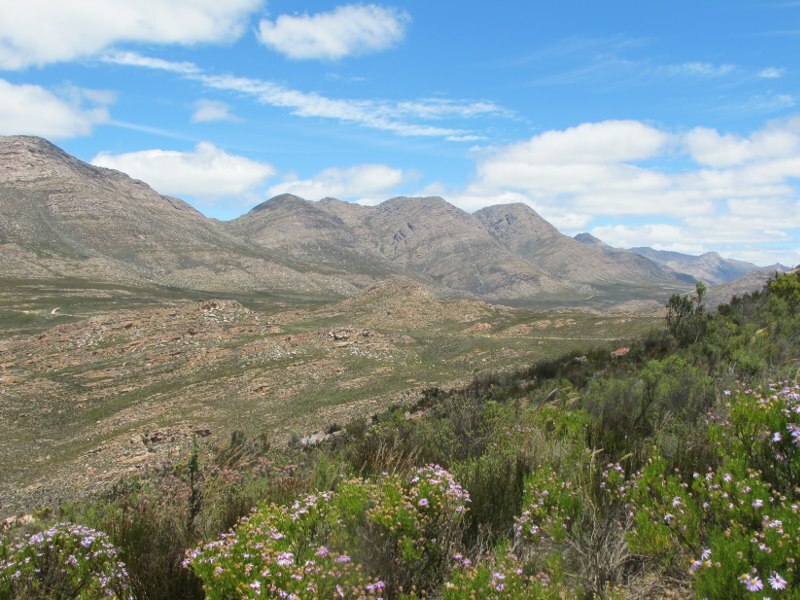 The Swartberg Mountains in the Western Cape province of South Africa are considered to be one of the finest exposed fold mountain chains in the world. Two dramatic passes afford the geologist unparalleled views of Paleozoic quarzitic sandstones folded spectacular fashion. 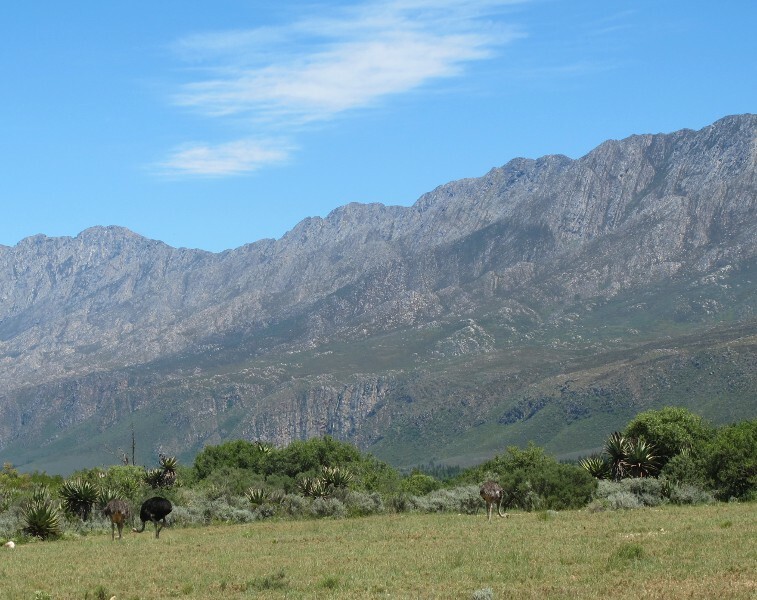 The Swartberg (Black Mountains in Afrikaans) range, part of the Cape Fold Belt, stretches from the town of Laingsburg, 200 km east of Cape Town, eastwards for 230 km, with the Klein Karoo to the south and the vast expanse of the Groot Karoo to the north. 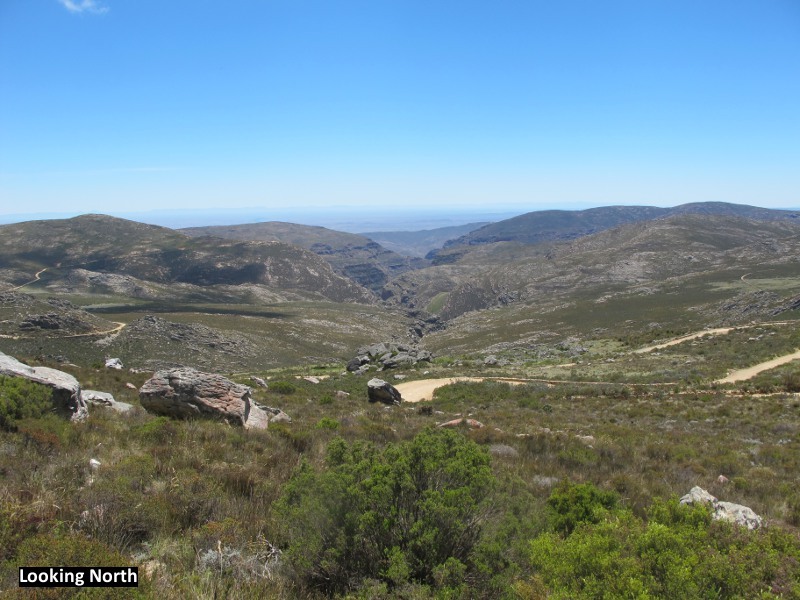 The easternmost end of the range rises over 2,000m and is traversed by two dramatic roads: the paved Meiringspoort Pass and unpaved Swartberg Pass. 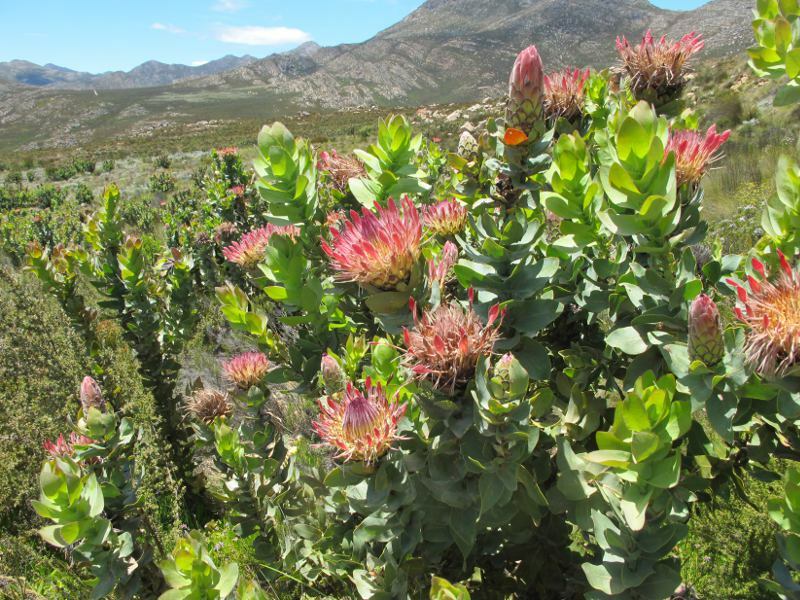 It is possible to drive a circular route encompassing both these passes – a round trip from the town of Oudtshoorn of about 170 km – in a day, allowing for frequent stops to gaze at the breathtaking views and the awe-inspiring rocks, and also the beautiful flowers, vegetation and bird life. 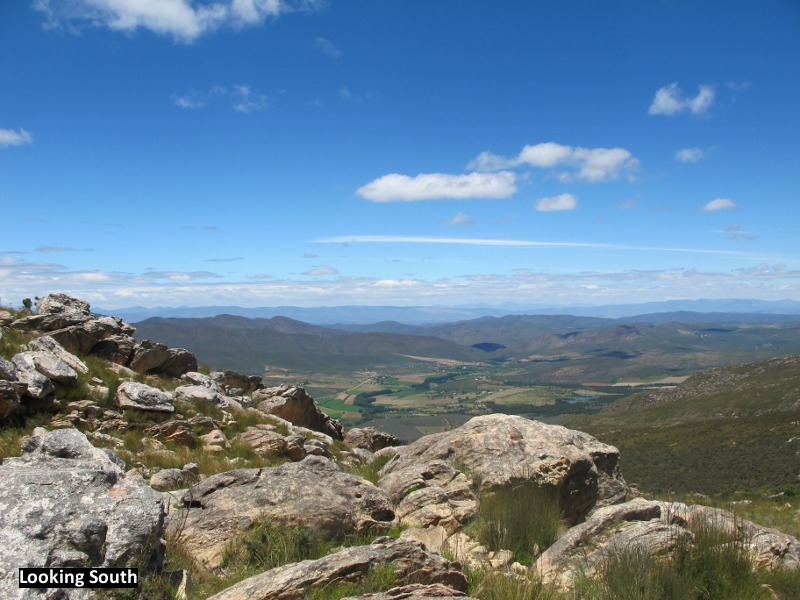 Much of the Swartberg range is a UNESCO World Heritage site. 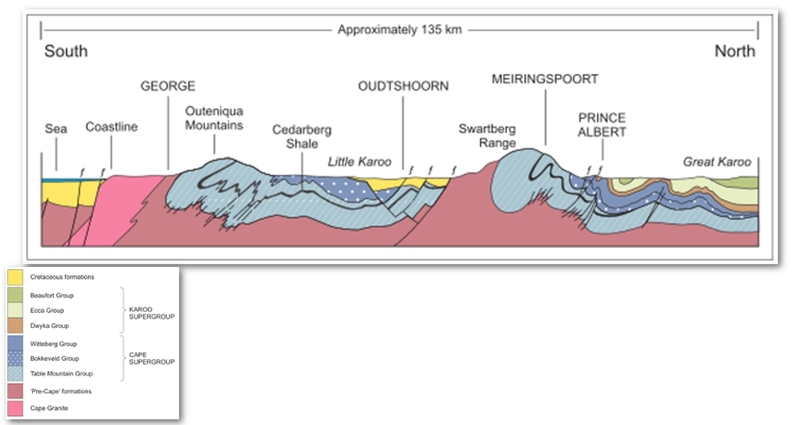 The geology of the Western Cape region is dominated by the Ordovician to Lower Devonian Cape Supergroup (CSG). This originally consisted of as much as 10,000m of layered sandstones and shales, deposited in a rift valley on a subsiding continental margin, and lying unconformably on top of Precambrian basement sandstones, siltstones and thick mudstones. 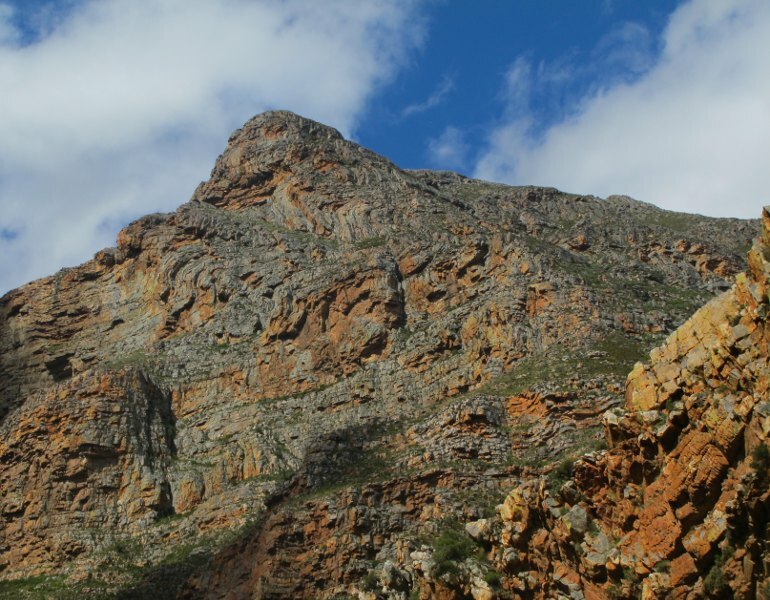 These older rocks are mostly found in the vicinity of Cape Town and the far west of the Western Cape, but also outcrop at the foot of the Swartberg Mountains as the Cango Caves Group, and comprise limestones, turbidites and conglomerates. About 330 million years ago, as the continents collided to form the super continent of Pangea, a subduction zone formed in the south, causing the CSG to undergo uplift and compression, which deformed and folded the previously horizontal layers, forming a mountain range up to 7 km high. The weight of the buildup of these mountains caused subsidence, and a large basin formed to the north. 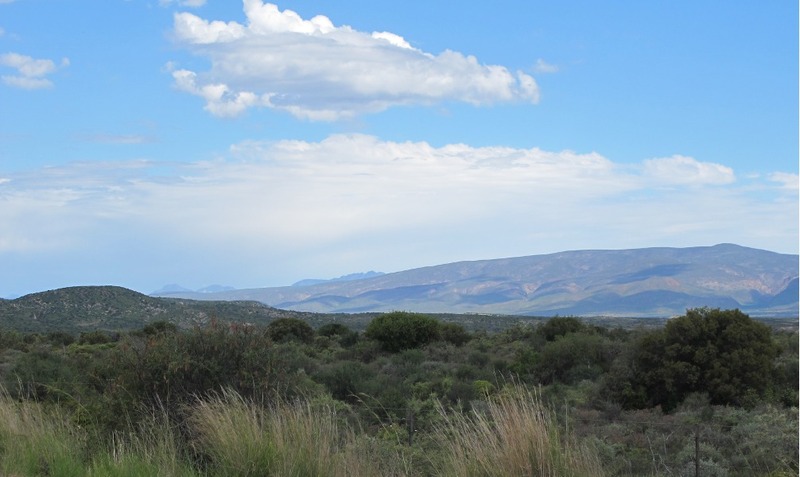 Between the Late Carboniferous and the Early Jurassic this filled with the sediments partially derived from the CSG rocks to form the Karoo Supergroup, which form the Karoo Plateau that now lies over much of the center of South Africa, stretching from the northern Cape area over 1,000 km to Johannesburg. 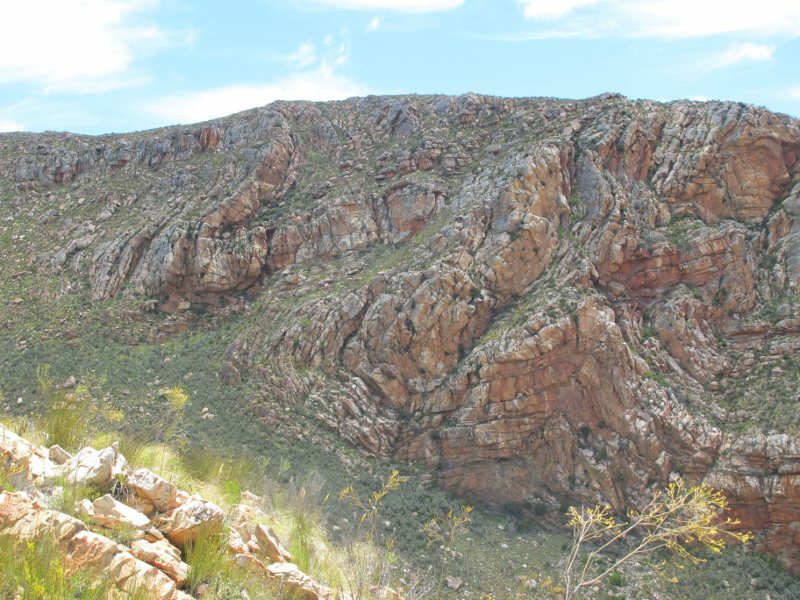 The CSG rocks underwent extensive erosion during this period and were partially buried by Karoo sediments, but re-emerged during the tectonic upheavals which resulted from the breakup of Gondwana about 150 Ma to form the Cape Fold Belt. This runs predominantly east-west for about 1,000 km across the southern tip of present-day Africa, with the westernmost arm trending north-south parallel to the west coast. 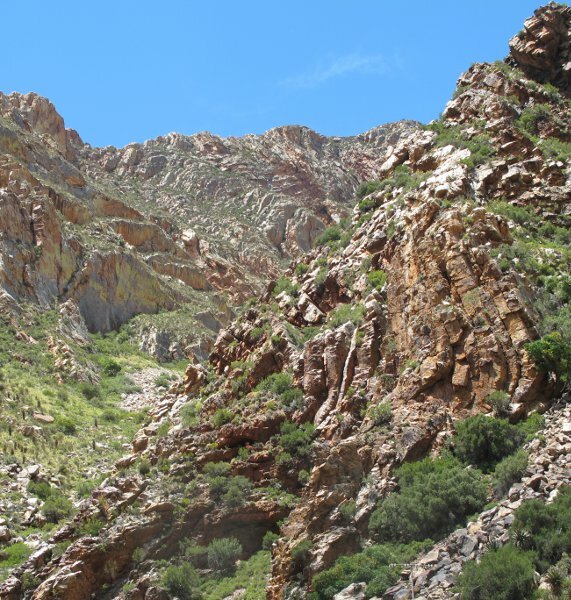 Some Cretaceous sedimentation occurred in the Western Cape area, but much has been eroded except in the Oudtshoorn Basin south of the Swartberg Mountains, although it is believed to be widespread offshore. An extensive fault system runs through the Western Cape parallel to the Cape Fold Belt, with evidence of older faults being reactivated into thrusts due to compression. Along the southern edge of the Swartberg Mountains the Cango Fault, which extends for 320 km eastwards from Cape Town, forms the boundary between the Cretaceous sediments of the Uitenhage Group in the Oudtshoorn Basin and the uplifted older rocks of the Swartberg Mountains, with rocks of the Precambrian Cango Caves Group exposed at their base. 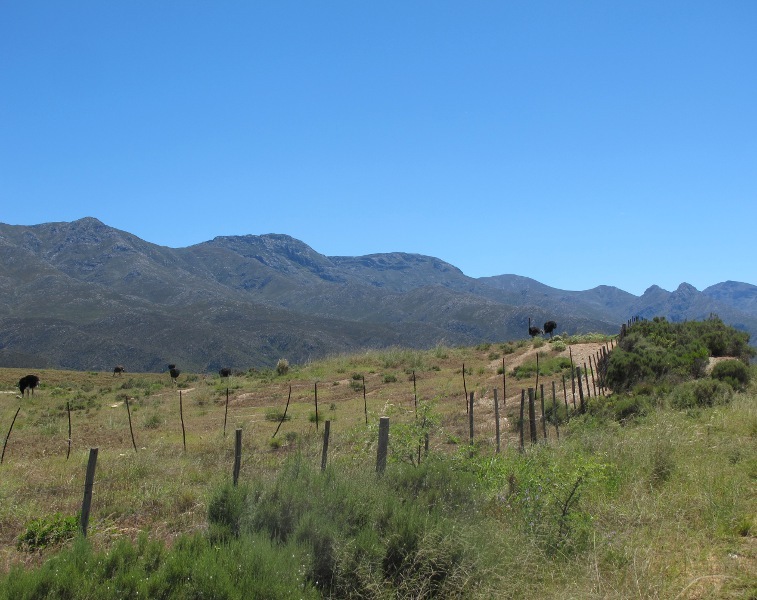 The Klein Karoo is a semi-arid valley between the Outeniqua Mountains (in the far distance) and the Swartberg range. 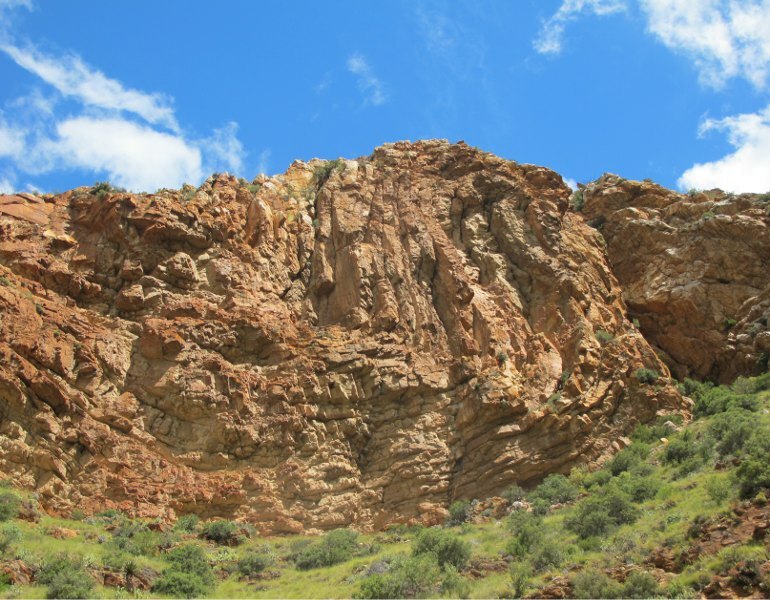 In the Oudtshoorn region it is underlain by the relatively soft clastic sediments of the Jurassic-Cretaceous Uitenhage Group, a diverse group deposited in shallow marine environments. 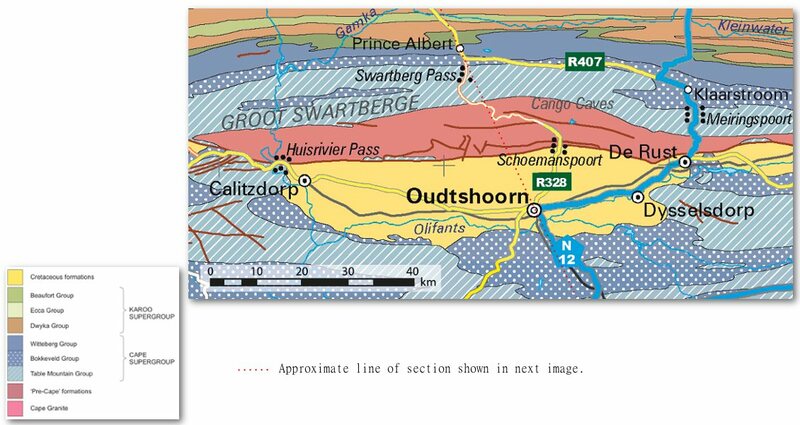 Between Schoemanshoek and the Cango Caves you cross the Cango Fault and move from the reddish brown conglomerates of the Enon Formation, part of the Cretaceous Uitenhage Group, into the much older slates and dark limestones of the Upper Precambrian Cango Group, the darker rocks. The cliffs of the TMG quartzite tower above them. 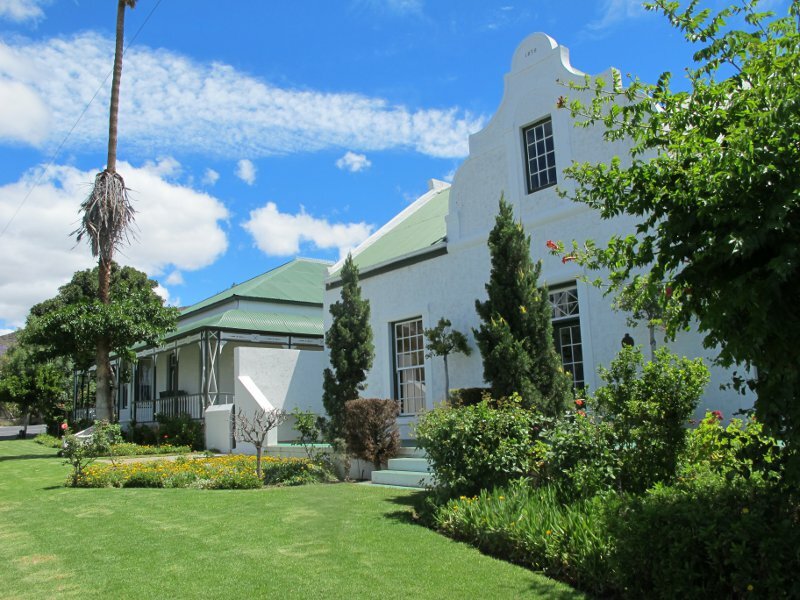 Oudtshoorn is famous for ostrich farming. The Cango Caves are a major tourist attraction in the area. 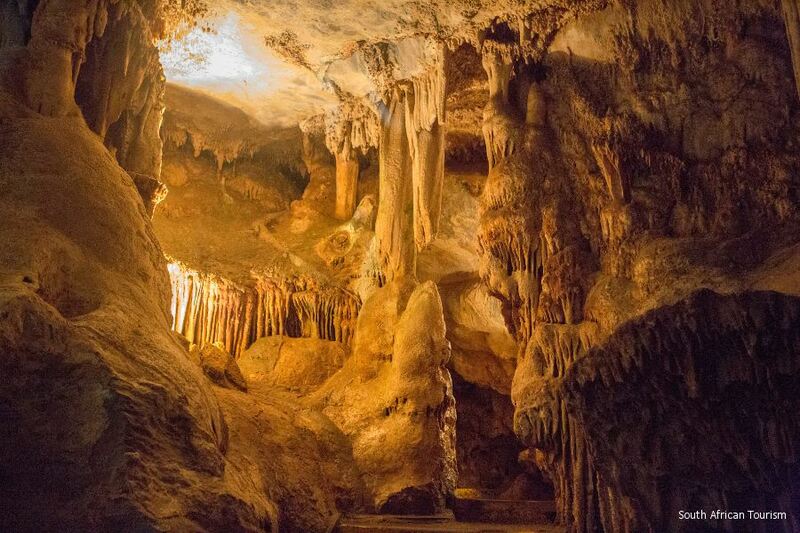 The extensive system of caves and tunnels in the 1,200m thick Cango limestone covers about 4 km, although only a quarter is open to visitors. Cango is the local San word for water mountains, because of the number of streams rising here. 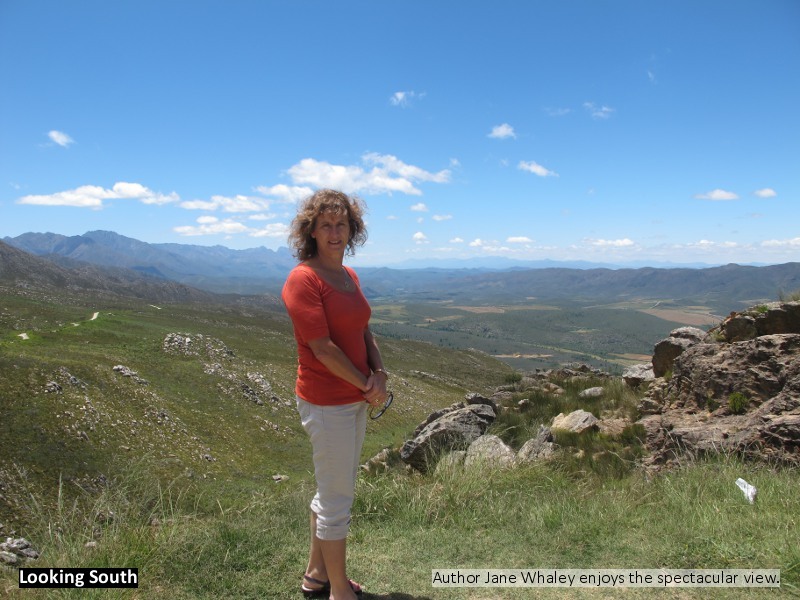 The views from the top of the Swartberg Pass, both north and south, are truly spectacular, as can be seen in the photos opposite. Looking back towards the top of the Swartberg Pass along the ridge of almost vertically bedded rocks of the Table Mountain Group. Spectacularly folded quartzites, again from the TMG, lie immediately above the thin Cedarberg shale layer, which acted as a plane of dislocation. This area is reputed to have some of the best exposures of folded mountain rocks in the world. 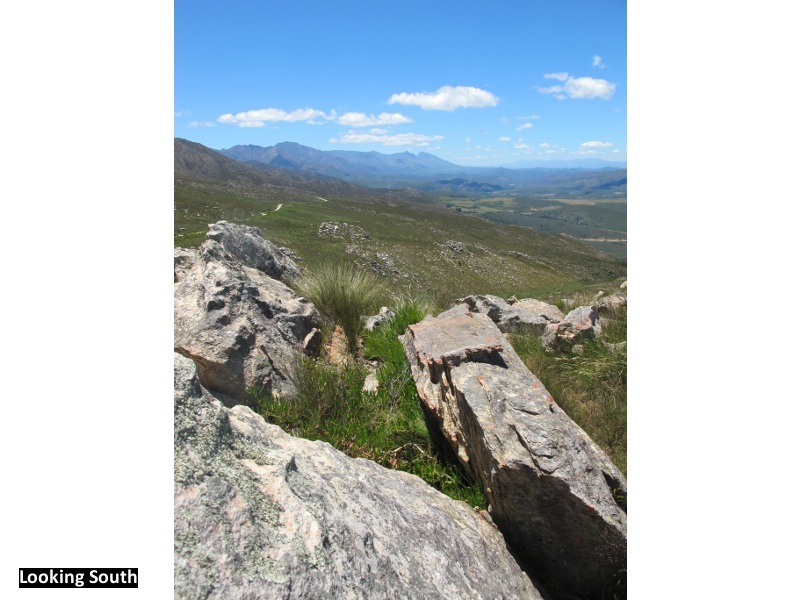 Near the northern end of the pass you find vertically bedded quartzites of the Witteberg Group, some of the youngest rocks of the CSG. 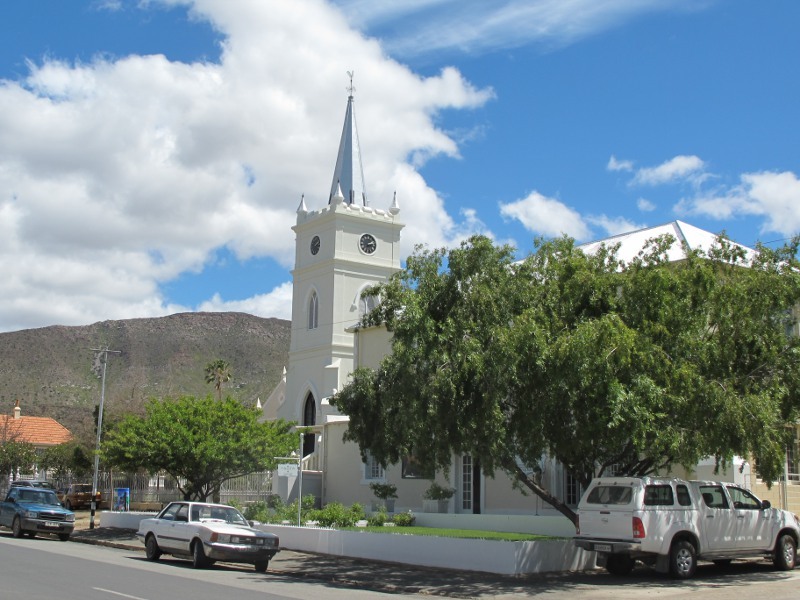 The small picturesque town of Prince Albert, backed by the Swartberg Mountains, marks the beginning of the Groot Karoo. 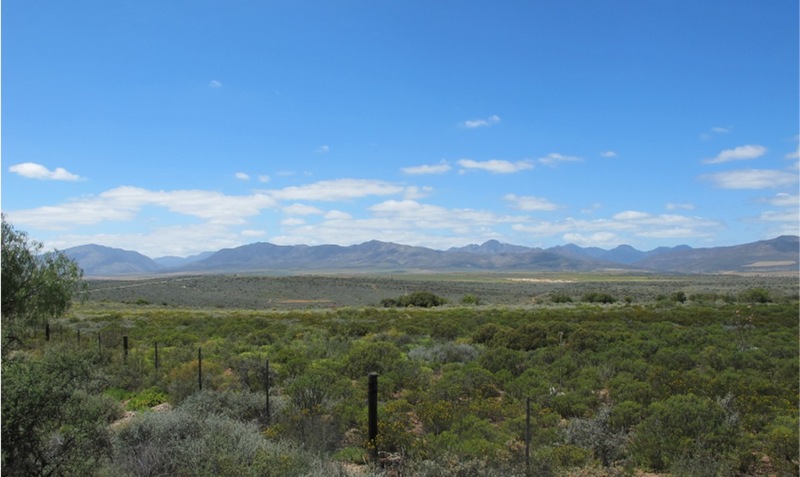 It is situated on sandstones and shales of the Carboniferous to Triassic Karoo supergroup, which underlies much of South Africa beyond the Cape region. 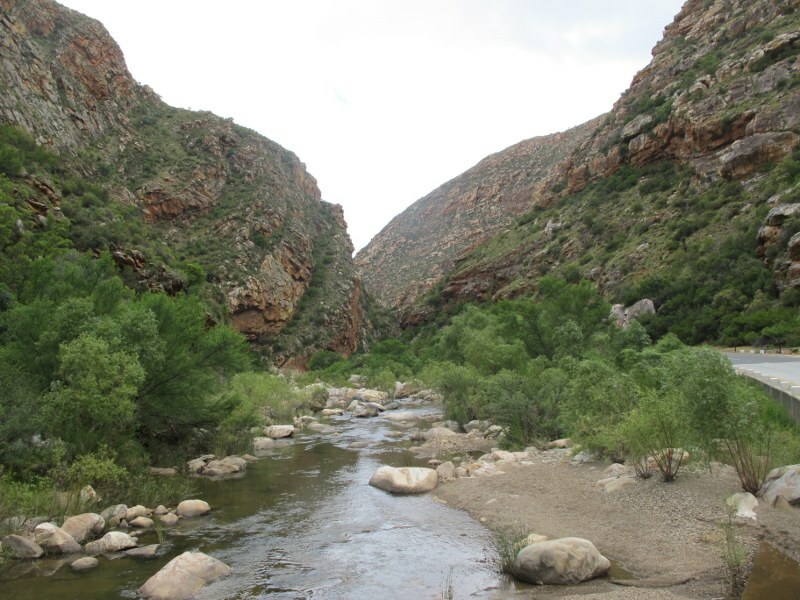 The paved road back to Oudtshoorn goes through the beautiful Meiringspoort Pass, very different in character to the Swartberg Pass, as it follows the river through a steep-sided valley through the Bokkeveld and Table Mountain Groups. 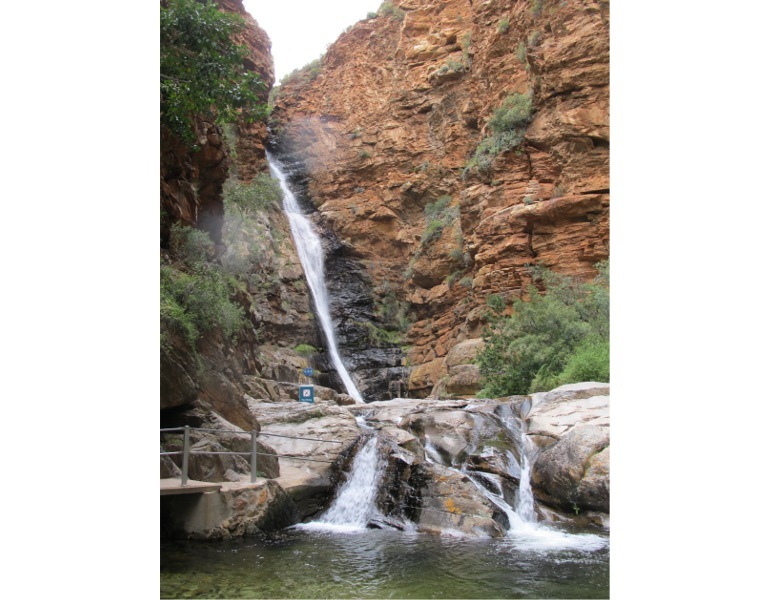 Heading south through Meiringspoort, stop at the information point at the picturesque 60m high waterfall and admire the steeply folded TMG rocks which form the steep sides of the valley in all directions. 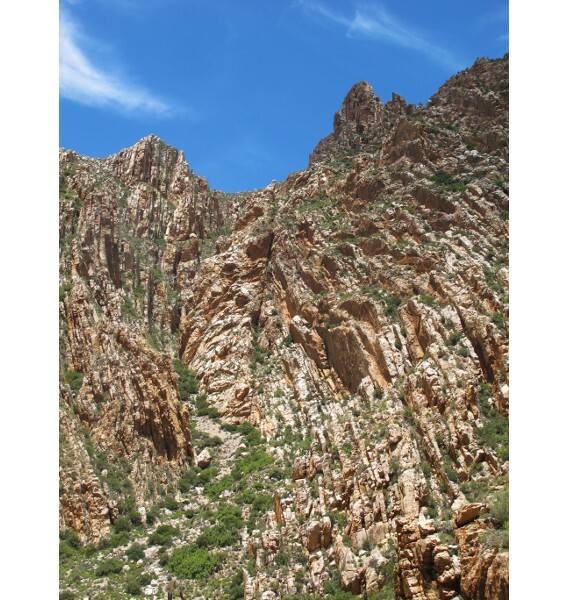 The Swartberg Pass (the westernmost route through the mountains) is a national monument, honoring the amazing achievement of Thomas Bain, the engineer who (with help from convict labor and lots of gunpowder) created the 24 km-long road, which was opened in 1888. 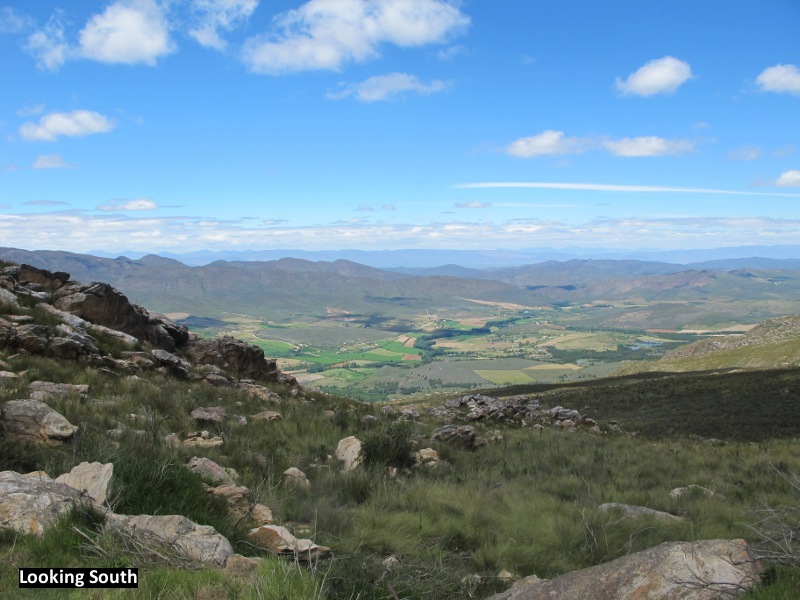 It travels up the southern side of the mountains, predominantly composed of massive quartzites of the lower Table Mountain Group (TMG), the oldest rocks of the CSG, which rise almost vertically over 1,000m from the valley floor. 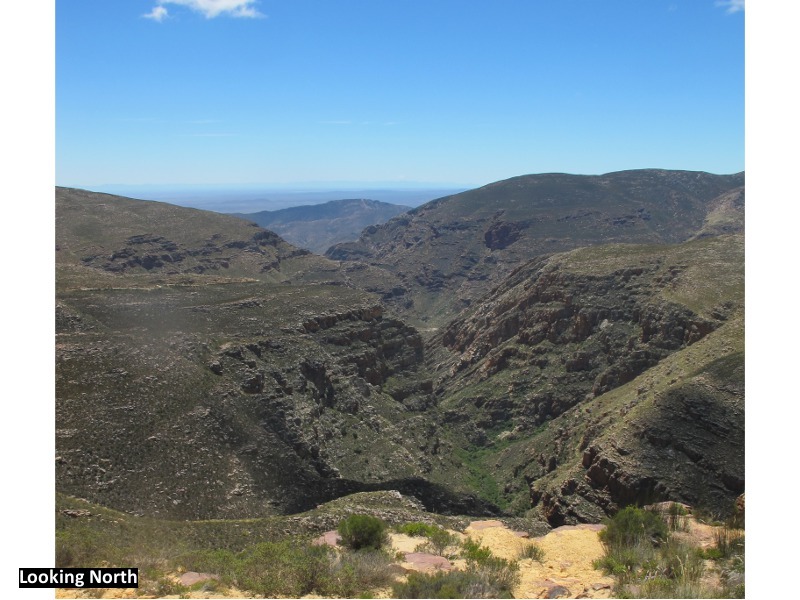 It then winds down through the crevasses and folds of younger TMG sediments, to Prince Albert and the Groot Karoo. The road is gravel, but unless there has been a lot of rain it does not require a four-wheel drive car. 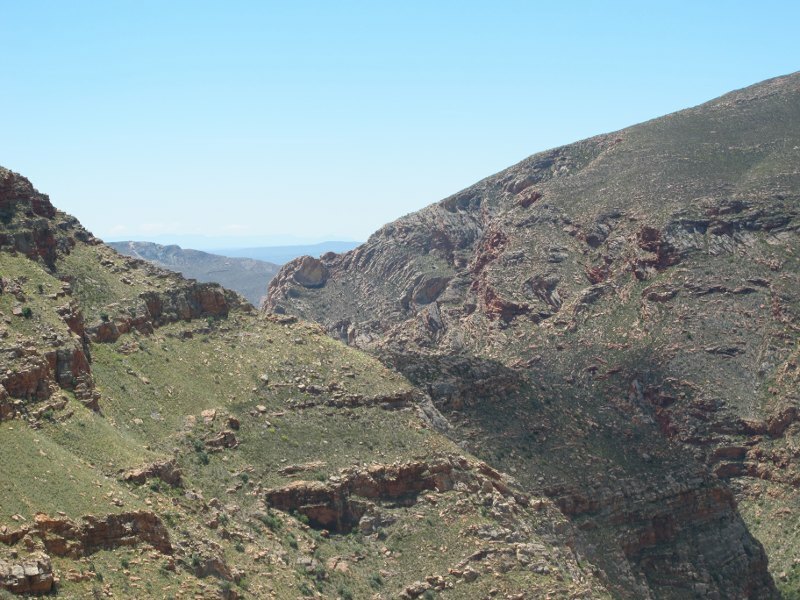 Meiringspoort Pass is now traversed by the main N12 north-south road from Beaufort West to the coast, but the first, rather rough road through the pass opened in 1858. 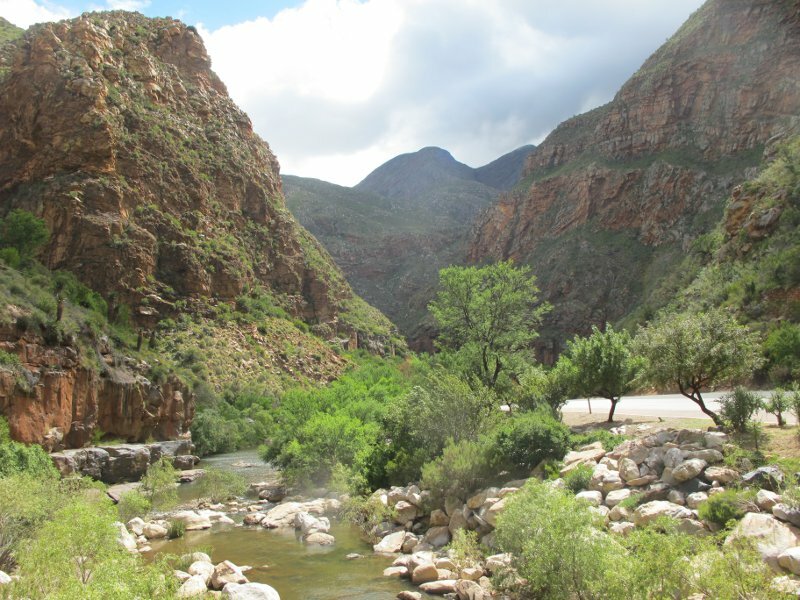 It is very different to the Swartberg Pass, as the route follows the path of the Groot River, which has eroded through the surrounding mountains to form a deep canyon. The soaring cliffs on either side show more fantastic exposures of folded and refolded TMG rocks. The route crosses the river 25 times, a fantastic feat of engineering – but this meant that the road was susceptible to flooding and eventually, to avoid this, the alternative western route was constructed. Norman, N. and Whitfield, G.; Geological Journeys: A Traveller’ s Guide to South Africa’s Rocks and Landforms. Struik Nature Publishers and Council for Geoscience, 2006. Compton, J. S.; The Rocks and Mountains of Cape Town. Double Storey Books, 2006. The Ngorongoro Conservation Area in Northern Tanzania is a World Heritage site renowned for its beauty and unique wildlife and one of the few places where active continental break-up and its attendant magmatism can be observed today. Spectacular natural scenery, deep canyons, salt mining and dinosaurs – so much to see in the Chóngqìng area of south central China.